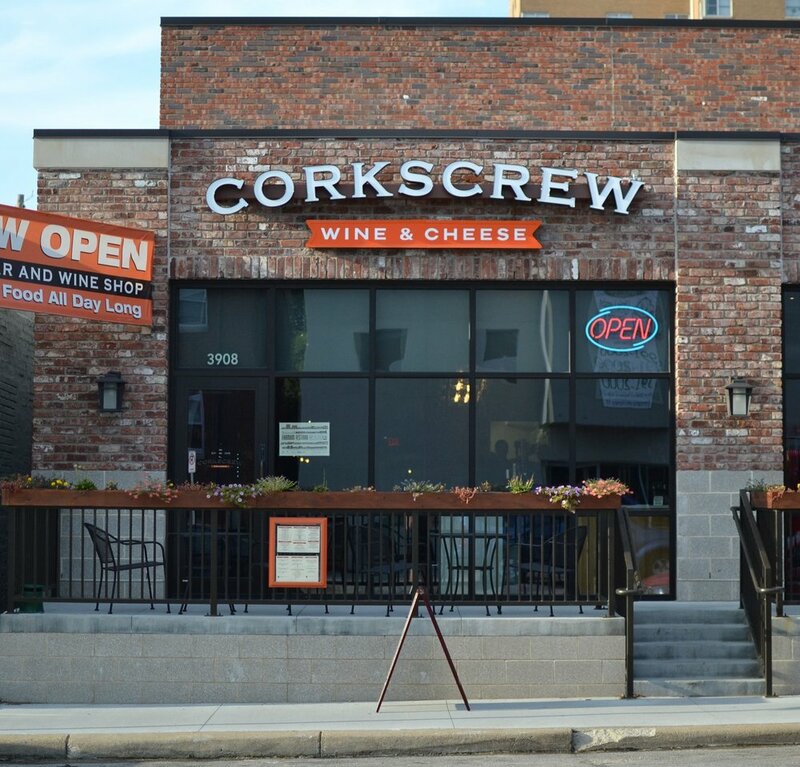 Corkscrew Wine & Cheese is a wine bar and retail wine shop under one roof. With 700 choices for wine we offer everything from California to Chianti and from $10 to $300 without being overwhelming. Visit us for your next wine purchase and let us deliver a better bottle within your budget. Bring your friends for a great alternative to the bar scene at our wine bar. From lunch to close, we serve 20 wines by the glass, beer & spirits along with menu of snacks and desserts. Host a happy hour, party or meeting up to 50 guests in our private garage at our Blackstone location. Stop by before or after dinner and enjoy a glass and snacks on our outdoor patio. Corkscrew Wine and Cheese was established by husband and wife Corey & Anne Keith in 2005. We wanted to bring the two concepts of a wine shop and wine bar under one roof. You could take the multipage business plan and distill it down into three words: Starbucks meets wine. 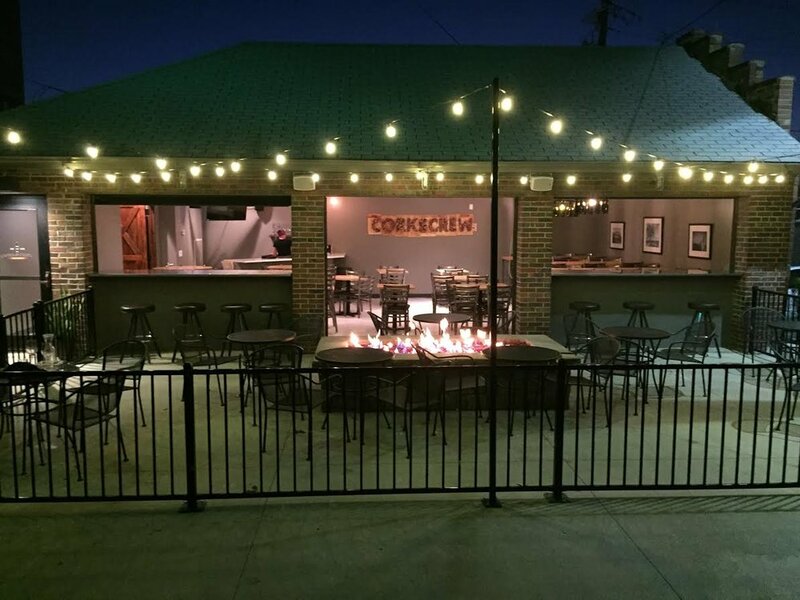 Corey and Jessica Keith, a brother and sister team launched the second Corkscrew location in the newly developed Blackstone neighborhood. Sharing the same values, commitment, and loyalty; not to mention love of wine; the Blackstone Corkscrew was developed and opened for business in early 2015. At Corkscrew we want to create that third place outside of home and work where you live your life and have a social experience. Come in & enjoy! Below you will see the food items available at each location. At this time, our Rockbrook location has a limited food menu compared to our Blackstone location. Both locations offer a rotating drink menu of 20 plus Wines by the glass, 20 plus Beers, Cocktails & Spirits. Retail Wine Bottles are available to consume onsite for a $5 corkage fee. Corkscrew's Private Party Room at the Blackstone Location has glass garage doors that open to our patio add a distinctive and modern addition! Planning a once in a lifetime event or weekly meetings perfect for birthdays, bridal / baby showers,wedding receptions, corporate events/ lunches, holiday parties, networking events and fundraisers. Blackstone & Rockbrook can close to the public for large private events up to 125 + people. Both locations offer reservations, semi-private parties, private parties & full venue rental for large events. No matter how many variables we think of, there are always unique desires. let us know of any special needs, wishes or questions. Contact us to book the space for your next social event! We also offer full OFF-Site Catering, Catering Delivery as well Catering Pick Up! Wine Tastings are a fun way to learn about new wines! It is a great way to enjoy company with loved ones, friends, celebrating a bridal / bachelorette party, birthday celebrations, work outings or just with the intent to try something new! We offer wine tastings that range from informal to completely customized specific to you and your group. We have wine tasting options for all group sizes. Want a more intimate tasting hosted in your home? We offer offsite Wine Tastings throughout the greater Omaha-land area. Contact us today to arrange a Wine Tasting for your next social event! *Wine Tastings must be arranged in advance. Take your knowledge of wine to the next level! Our intent is to provide wine education and training at all levels in a non-intimidating way. We offer a variety of ways for every customer to learn more about wine. Wine classes are more classroom style that is interactive with an average of 24 people per class. A $5 off coupon to use towards a retail purchase for each participant! If you are looking for more of a social outing with some wine education check out our Wine Tasting options. Wine 101 - Intro to Wine! "How is wine made? How do you taste it? What does "oak" mean? Learn the basics in this fun, interactive class over our favorite beverage - WINE! We'll help you taste like a pro!" Is it Red or White? What is Rose? Is it dry, sweet or both? We LOVE our Rose wines and want to tell you all about this varietal. Cancellations are accepted for a full refund with notice of at least 14 days prior to your scheduled class date. Ever had trouble selecting cheese to enhance your wine, or wine to complement your cheese? Wish you could just drop by and have a bottle of wine and a light appetizer or dessert waiting for you? Maybe you’ve had a long day and you need something to munch on while you’re preparing dinner. All for just $29.99+tax each month! Stop by the Corkscrew starting on the 1st Sunday of each month to pick up your goodies. You can take them to go, or you are more than welcome to stay and enjoy them in the company of friends here at the Corkscrew. We’ll do all the work, you have all the fun - Sign up today! If this purchase is for a gift; when processing payment in the shipping information provide us with the information for whom you are gifting this for and in the "notes" section please note this is for a gift with your phone number. We will call you to confirm the details. Corkscrew Wine and Cheese offers you unique gift options for the hard to shop for person! Both options are perfect for all occasions such as; birthdays, holidays, engagement, weddings, co-workers or just a nice way to say thank you. Cards can be used at both locations! No restrictions! You select the amount! When processing your purchase, please provide the address where you want the card sent in the shipping information. If you are sending this as a gift; in the "notes" section please provide the name and message you would like to add to the card (optional). Need a unique gift idea for corporate coworkers, clients, personal friends or family? Gift Boxes Include one or two bottles of wine with Olive Oil & Sea Salt Crackers, Wisconsin Cheese, Mille Lacs Original Beef Summer Sausage and Chocolate Caramel Popcorn! When processing the purchase in the "note" section please provide the name of the person, address, preferred date & time you wish to have this gift basket delivered and a personal note that you would like on the card (optional). If purchasing one bottle option, please indicate if you want Red of White. Gift Baskets are available for purchase onsite at both locations. 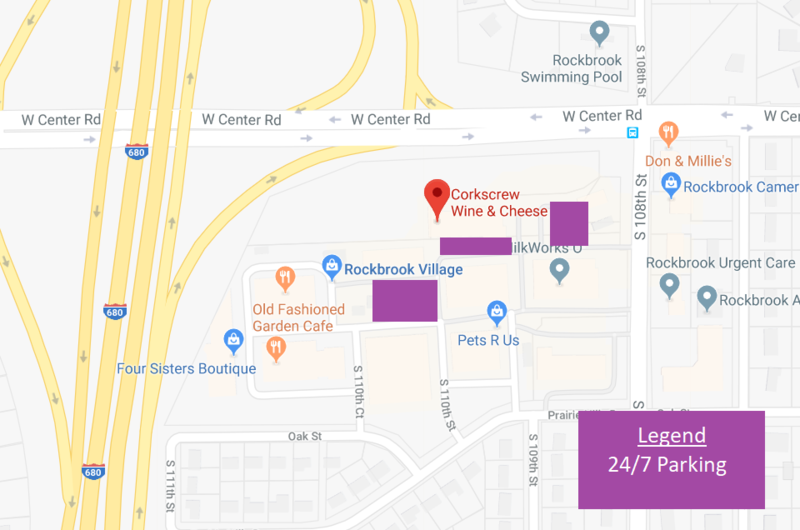 Corkscrew Wine & Cheese has two locations. The Rockbrook location first opened by Corey & Anne Keith in 2005. The second location opened January 2015 by Corey Keith & Jessica Keith (Sister).